The location was at an elegant older hotel in Washington DC at a portion of just one of their many well tended flower beds which surround the hotel . The "Take It!" 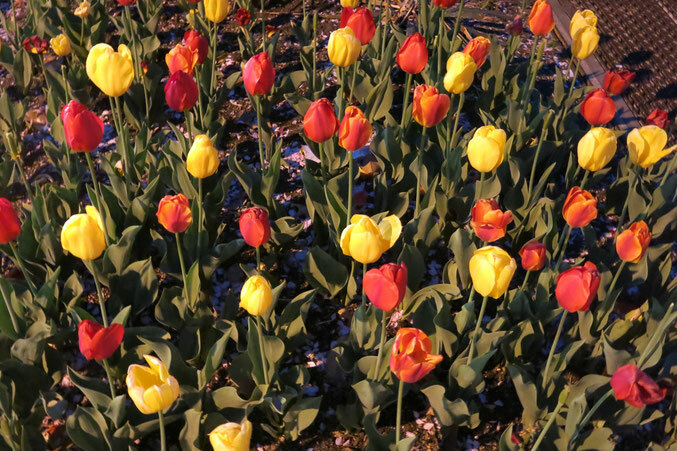 came from having seen Tulips under lights in the evening as well as viewing them at night in the dim light where they are located away from overhead city illumination. This time on the clock is taken by this flower to close and do whatever it does to get ready for its opening after dawn. It is not fooled by artificial lighting. It knows that it is time to sleep and get rested up for its all day show of the next morning. The After Take: How lucky we are to be able to live our lives accompanied by plant life. To have the beauty of flowers available to us is worthy of wonder. There is constantly a part of my mind available for searching for plant life no matter what the season or time of day it can be found, in order to enjoy its shape, texture or at its special time of year, magnificent color. Here is hoping you too have many opportunities to view flowers as they engage in being " bed heads " in every sense of the words. It looks like they are starting to wake up. My wife now wants a tulip garden. Looks like my day off is gonna be spent at home depot. Stunning! These are so colorful and beautiful, such an array of colors!!!! It looks like some of them are a cross pollination between the yellow and the red ones. Those are some stunning looking flowers. Hi Teri, its actually a different type of tulip. I cannot remember its name but I have some just like it in my rose garden. Maybe if I show my mom these I wont have to get her anything for mothers day.